9.18.18 Even a vacation has it’s bad days, but mostly holidays are experiences that recharge a person’s batteries to return to the grind of the workaday world. For WGC Commissioner Mike Carstensen, however, farming is, “A Vacation Everyday.” In episode 91 of Wheat All About It!, Scott Yates joined Carstensen in his combine in late August as he finished an excellent 2018 harvest. Listen in as the pair talk about his farm, his challenges and his take on political events in the world. iPhones have dedicated podcast apps (purple icon). 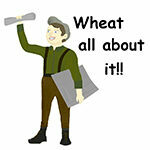 Press and type Wheat All About It in the finder to start listening!